As we continue to grow Guild Wars 2 and plan our next steps for the future of the game, it’s important we have a solid foundation for all the new players we plan to welcome in the future as well as players who return after long breaks from our game. The coming feature pack is bringing improvements that were designed to ensure the leveling experience and, most importantly, the learning experience is solid, clearly messaged, easy to follow, and rewarding. These were part of the game when we launched in China, and now they’re making their way back to North America and Europe. One of our first changes is the content direction system. This system simplifies the UI in the top-right side of the game window, providing one clear suggested location (and an arrow providing general direction) to guide players to exciting content. This system will also help guide players to content areas of appropriate level difficulty, even to the next map so they have a better idea of where to go when advancing their character. 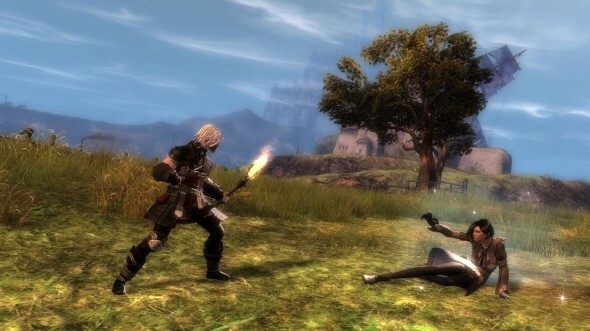 Players who don’t need direction can ignore this system and go exploring in any direction they want, do content in any order, and play any content they want exactly as they can currently in Guild Wars 2 as it’s available today. There are advanced settings in the options menu for more experienced players that will allow you to change the functionality of the content direction system. You can select to disable it if you like the way the game UI functions now, or you can select “world complete” mode, which will focus only on providing direction to areas for world completion. There are still countless bonus locations that remain hidden in the world, such as jumping puzzles, minidungeons, bears’ picnics, quaggan pipe organs, and legendary llamas, that the content direction system won’t guide you to; the system’s simply there to provide players who need a bit more structure with a guide along their adventure. Next up is our new level-up notification, which is a shiny badge that sits down where bouncy chests go now and pops up each time you gain a level. Clicking on this notification will open a brand-new reward screen. There are three major purposes for this level-up screen: to make gaining a level feel truly rewarding, showing you what you’ll get at the next level, and teaching important game systems. To help ease the learning curve for new players experience when they first load into the game, we’ve simplified the number of systems visible to players early on and layered them all into the level-up guide. When you reach a specific level, any system tied to that level will be presented in the form of a reward. The game will also offer to teach you how to use the new system and will show you what you’ll get the next time you level up. For experienced players, most systems are still available as they are today; we will simply introduce these systems more gradually to new players and allow them to learn our game at a reasonable pace. For example, WvW and PvP will be messaged to players via the level-up notification system at levels 18 and 22, and the buttons in the top left will be hidden until then, but experienced users can use the portals in Lion’s Arch or use hot keys to access those game modes immediately. Once the buttons are unlocked for one character on your account, they’ll be visible to all future characters as well. Some systems have been layered further along the leveling progression and will become fully unlocked when you reach those levels to help give players more time to learn the core game systems. For example, rallying from the downed state can be overwhelming to a brand-new Guild Wars 2 player. We’ve moved the downed state to unlock at level five so players have time to learn the basics of combat before they experience this system. We also made the downed state give you additional health early on to help make it easier to learn. As we layered in systems and new rewards across the levels, some other features like weapon swapping and skill slot unlocks have been moved a bit to fill in better with the progression of mechanics we’ve established. We’ve also taken some of the systems that felt needlessly complicated or obtuse and simplified them to make them consistent, so leveling is the big way you gain new abilities. 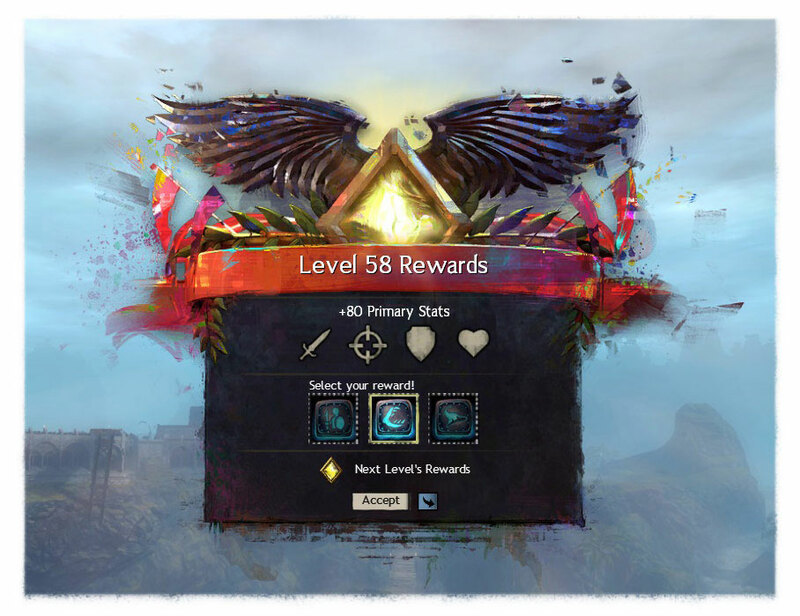 Our last feature pack also changed traits to no longer require going to a merchant and buying a book at each tier to unlock them; you unlock a tier for free as soon as you reach the appropriate level. Now, new skill slots for weapons will be unlocked for all weapons simultaneously as you level up. This means that if you pick up a new weapon for the first time after already unlocking multiple weapon skill slots, you’ll automatically learn the skills for that weapon, rather than having to learn each weapon’s skills individually. To create a better sense of pacing in the progression of the game, we’ve spread out some of the character progression’s statistical rewards to come in chunks. When you gain a level, you’ll know you’re progressing in a way that immediately benefits your character. You’ll be able to experience a clear power difference in your character when you reach these milestones rather than having tiny, hard-to-notice increments with each level. All the stats, skill points, and trait points remain the same by the time you reach level 80; we’re simply changing up the pacing of the levels they’re rewarded at. As part of the addition of the level-up guide, we’ve reevaluated the item rewards you gain for leveling and made them more exciting, relevant, and useful items. We won’t be able to retroactively give these rewards to existing level 80 characters, but all characters under 80 will use this system for their remaining levels between their current level and level 80. All new characters you create after this system will have access to all of these changes from level 1. As another addition with the level-up guide, we’re updating the personal story steps using our new Story Journal so they come in story chunks that unlock all at once per chapter. When a story chapter is unlocked as a level-up reward, you’ll be able to play straight through the entire chapter from start to finish and not have any awkward starts and stops that throw off the storyline. In this way, story chapters become another big moment to look forward to earning and unlocking as your character levels up. We’ve also taken this opportunity to go back and reevaluate the rewards of each of the major story chapters. We’ve done some pretty major overhauls to make the rewards for completing chapters feel much more compelling than they were in the past. 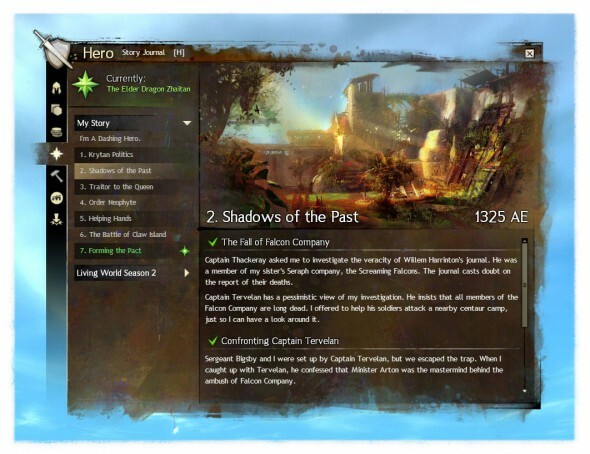 Personal story chapters will absolutely be worth completing for your character as you progress. Similar to level-up rewards, we won’t be able to retroactively apply these to current level 80 characters, but all future characters you create or level up to 80 will benefit from this system. That covers all the changes to the teaching and leveling experiences we’ll be making with the September 2014 Feature Pack. 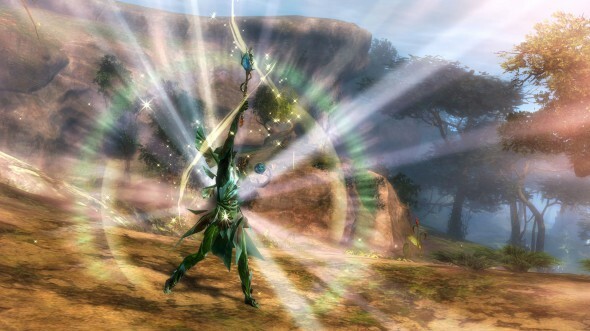 Once the feature pack is live, there is no better time for those who haven’t tried Guild Wars 2 to hop in and give it a shot. For those who haven’t played the game in a long time, it’s a perfect time to return, see if the new systems help make your experience better, and explore the world of Tyria anew! Our feature countdown continues next week, so keep an eye on our website for the announcement of the next major feature coming soon to a Guild Wars 2 near you!